For my 6th birthday in 1961, I was given a Märklin railway modelling set. Over time, it was extended with rolling stock, turnouts and other accessories. My parents decided to give me a large table, so I could create a fixed layout and did not have to take it apart and reassemble every time. At the time, digital control was not yet available, so the only way to control two trains on the same track was to use overhead lines for the electric type locomotive and the rails supply for the other. Using the model railway, basic knowledge about electronic circuits was acquired. He worked in one of the many Philips factories and had easy access to redundant parts. I was around 8 years old, when he visited us and brought some electronic parts with him. He said: “Well, let’s build a rectifier”. I did not have a clue, so he explained what diodes did and how one could transform AC into DC. We built a bridge rectifier with a smoothing capacitor, so I had a DC power supply. But there was little use for the thing, so it took a while before the story continued. But I consider my uncle to be responsible for sparking my interest in electronics. At the time, we did not have a radio or TV, but we had wired radio instead. It was a service, available over telephone lines. It was popular, because the sound quality was much better than medium wave AM reception and it also carried two extra programmes, compiled from foreign radio broadcasts. The system used audio amplifiers with valves and programmes were selected with a rotary switch. Each programme had its own wire pair. The system was closed in 1975. The two white cabinets are the amplifiers and the speaker is on the floor. 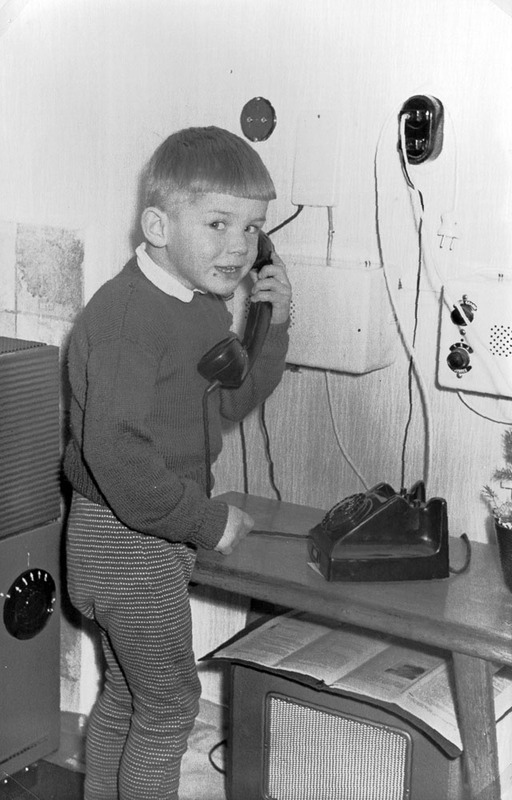 It was around 1964, when I got my first own radio receiver. Neighbours bought a new radio and offered me the old one. It appeared that it was not functioning very well, as it started humming after some time. Even though I could listen to many more stations, including the offshore stations transmitting from ships on the North Sea, the hum did not add to the listening pleasure. As I did not know how to fix the problem, the radio was disassembled and the parts stored in a carton box (I will get back to this later). My grandmother felt sorry for me and decided to give me and my sister her radio. We had to share it, but most of the time, the radio was in my room, but not without the odd quarrel, of course. It is on the picture with the model railway, the round dial is just visible at the top left. Portable radio’s started to become available. I gazed into show windows many times, but the prices were unaffordable with my little budget. 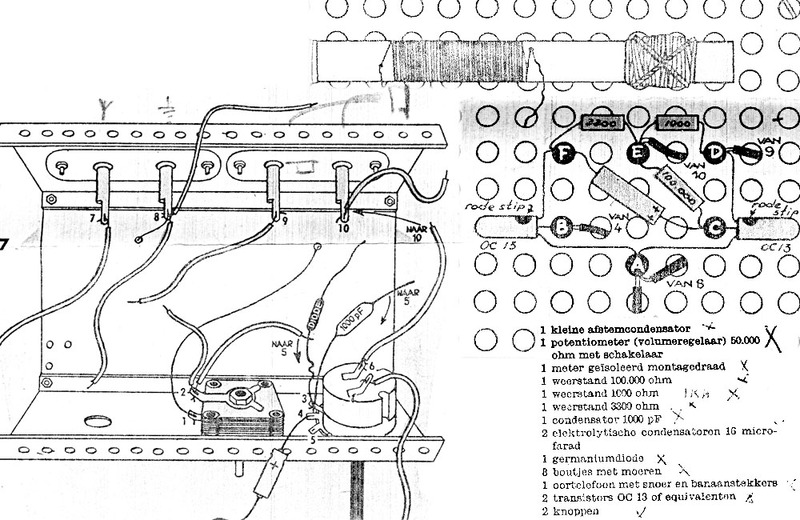 A book with “things to do” during summer holidays contained an article about building a radio. A radio shop was visited to get the prices of the necessary parts. Two transistors OC13 were needed, along with a diode, ferrite rod, tuning capacitor, along with some other parts. I remember the transistors to cost over 3 Dutch Guilders a piece (equivalent to roughly 10 euros today) and the rod and capacitor were also rather expensive. After weeks and weeks of saving, I went to the shop and bought the parts. The transistors and diode were packed in little carton boxes, similar to the way valves were packed. After a while, the project was built. But it did not work. No sound from the little earphone, except for some clicks when power was switched on. Numerous checks, but no faults found. I had to wait patiently for the next visit of my uncle Arnold. He looked at the radio and the circuit diagram and explained that the radio was not intended for portable use and needed an external wire antenna and ground. But why? “It has a ferrite rod, just like the Japanese portable radios. I was told that the rod is the receiving antenna.” I argued. Uncle Arnold showed me that it worked, but only with a wire antenna. However, even with that antenna reception was poor, as it was only a crystal radio which I was unaware of at the time. The two national medium wave programmes were fair, but the reception of offshore stations was poor. I was very disappointed… but my grandma stepped in again and bought me a “six transistor” portable radio. Apart from the short life of the little 9 V batteries, the radio was good. The battery life problem was solved with external batteries later on. A few years later, I got a radio with short wave reception. The original cabinet was replaced with a larger home made cabinet. It sounded very good. The dial was omitted by the builder, so one had to use some imagination when tuning. After some time, you got “the hang of it”, because one knew the order of the stations and many stations were recognised by their “character”. Although it had shortwave reception, I did not like it much, because of often distorted audio (as a result of multipath fading). I had two best friends, sharing interest for electronics. Two of us decided to build a private telephone line. After a number of evenings digging, the line was “ready for service” (private lines were illegal, so we worked in the dark). Using our radios (as audio amplifiers) and speakers connected to the line, we could communicate very well. Initiating a call was usually done by playing music:-) The line to the other friend was added some time later, to be able to communicate between the three of us. Me and my friends were fans of the offshore stations, like Radio Caroline and Radio London, which had good signals. A Dutch station, Radio Veronica, was very popular, but we did not like it particularly much. We preferred the English stations. We built our own ‘studio’ with home made mixers, old microphones and tape recorders (mine was a Grundig TK125). The mixer was built in a wooden cabinet and had been around for many years. We also recorded our own programmes, a number of interesting clips still existing. Listening to the offshore stations also triggered the interest for ‘DIY’ transmitting. In a radio shop, we found some schematic diagrams of transmitters, so we decided to try one of those. The FM transmitter was chosen, because it was relatively cheap (and simple). The main problem was the stability of the signal. But because the output power was limited, not much harm was done. We had great fun. The radio was used intensively for listening to broadcast stations. I also bought some books about amateur radio. By adding a BFO, I was able to detect SSB signals on 40 and 20 meters (other bands were not within the tuning range). I also started keeping a log of what I heard. A pointer was attached to the tuning capacitor. On the drum, the amateur bands were marked. The lid of the cabinet had to be opened to see the markings. Dolf also had a Dutch callsign list, enabling us to lookup stations we heard. At home, I mostly listened on 40 and 20 metres and logged quite a number of stations. Some stations really stood out, like PZ1DR on 20 m who was often talking to Dutch stations. It was quite remarkable that he sometimes was the only station in an otherwise quiet band. As far as we know, his father never noticed what we were doing. I wonder what he would have done if he found out (remember that he was working for the authorities overseeing the radio spectrum). Across the street, in a flat, we noticed an antenna on the roof. The callsign list of Dolf revealed that it should be of an amateur, PAoJDL. His name was John D. Laird, born in the USA, working in The Netherlands (as far as I know, he was a medical doctor). I decided to ring at the door and John was so kind to let me in. 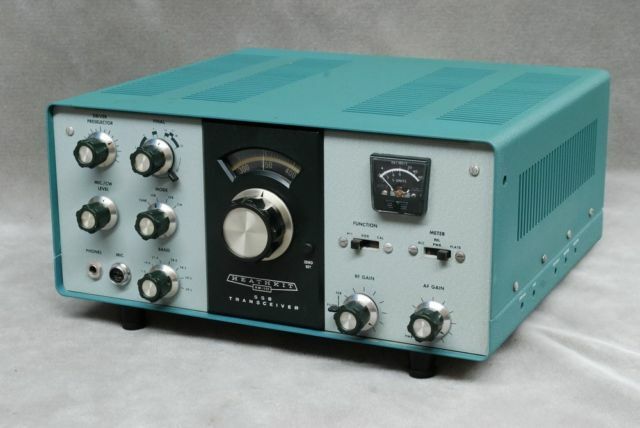 He showed me his equipment, a Heathkit HW101. John invited me me to listen with the HW-101. I was clearly instructed not to touch the microphone, which I would not have dared anyway. The equipment felt as if it had golden tuning knobs and a silver cabinet. I was used to my broadcast receiver with all its habits. The HW-101 had a narrow SSB filter, so stations on adjacent frequencies could be copied with ease. After all the excitement, John invited me to return the week after, which I did. It was an honour for which I still am grateful. In 1972, I moved to a town in the south of the country. In Rotterdam, I sometimes operated on CB with a modified walkie talkie. CB was not permitted at the time. The walkie talkie circuit board was mounted in a wooden cabinet and with a rotary switch, a number of channels could be selected. At my new location, there was hardly any CB activity. Interests shifted as well, being a teenager… So the radio hobby was low profile. But in 1975, I decided to take the exam and applied for a VHF licence. It became valid on the 1st of January, 1976.